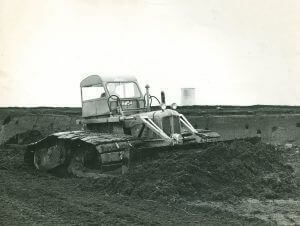 A machine specially designed by our engineers for heavy duty dozing and levelling bogland, particularly cutaway bog. The tractor chassis is a rigid frame fabricated from square hollow standard steel sections and plate, mounted on full tracks which incorporate our standard manganese track links and sprockets fitted with swamp shoes of extruded aluminium which interlock with each other on assembly. The power unit is a diesel engine of generous capacity which is used in a number of our large machines of various types. A standard automotive type gearbox and clutch unit is bolted rigidly to the engine giving an adequate selection of speeds. The power is transmitted from this gearbox through a cardan shaft to a specially designed reversing gearbox which in turn drives the differential unit of standard axle assembly. The final drive between the half-shafts of the axle unit to the track sprocket drive shaft is by transmission chains and sprockets. Band brakes of generous proportions are fitted on the half-shafts to effect steering. The driver’s cab is totally enclosed with sliding door. The controls are foot pedals for throttle and engine clutch and levers for sprag steering. The efficiency of the machine is enhanced by incorporating a speed increase for the reverse gears in the special reversing box. Bulldozing attachment consists of a blade fabricated in steel plate suitably stiffened and two push arms extended from the ends of the blades outside the tracks to the fulcrum point on the track frame. The blade is controlled by hydraulic rams for lifting and lowering. The hydraulic pump is mounted on the front of the engine and is driven direct from the engine crank-shaft through a flexible coupling. Bord na Móna has a large fleet of both standard and bog adapted tractors. Read More.